Damn it Jim, I'm a gunfighter, not a doctor! That's right. 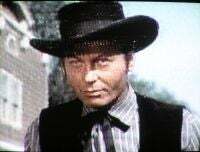 Before he was 'Bones' McCoy, he mostly acted in westerns. But his first real Hollywood role was in a low budget horror movie. Seriously.....who names their kid DeForest? Ernest and Clora Kelley, that's who. Should I mention he's named after a pioneer in the electronics field named Lee De Forest? Seems to me to be kind of irrelevant, so maybe I wont mention it. As an interesting fact about him though, he acted in three separate versions of Gunfight at the OK Coral. First as Ike Clanton, then as Morgan Earp, and finally as Tom McLaury. You might have noticed that 2 of the 3 times, he played one of the bad guys. That's not all that surprising. In his early career, most of his roles were as a bad guy. He tried to move out of that stereotype which led him to several roles where he played a doctor. Then, he was offered the role of Spock, which he turned down before accepting the role of Dr. McCoy. But, why am I talking about DeForest Kelley? It's Tell The Truth Tuesday, and you all want to know if I was lying or not yesterday. I was lying like a rug! The idea that the queens favorite movie was Spaceballs is a line I saw on a website where people wrote things that sounded true but weren't, and I decided to run with it. Although, I can picture the queen, wrapped up in her pink Snuggie, eating her popcorn, and laughing like a maniac when they pass through ludicrous speed and reach plaid! But anyway, I lied. Get over it. Moving on to todays subject, you may be thinking it's about Star Trek. And you may be wrong. See, Star Trek was science fiction. Today's oddity is a science fact. We are still in an ice age. That's a fact science will tell you. We are in a period of glacial recession. This period has only lasted 10,000 years or so, and that's why scientists won't say the ice age is over. Earth has a dynamic climate. That means it's climate, including it's average temps, fluctuates. So, global warming and global cooling will happen, no mater what we do. A large volcanic eruption, like Mt. Pinatubo in 1991, will release more greenhouse gas in that one even that humans have in the last 100 years. However, that is not to say man is not having an effect on the climate. We are. We not only release greenhouse gas, but we do other things as well, like deforest large areas of the world. This reduces the amount of carbon that can be stored and helps to heat things up. Both extremes of the global warming fight are wrong. On the one side, they say man has no impact. That's wrong. We do. The other side says man is the primary factor. That's wrong as well. While we affect the climate, we aren;t the primary driving factor. We're more like 'the straw that breaks the climates back'. Todays oddity does, however, have to do with deforestation. As in, if we want to stop the globes temps from rising, we need to do something about it. And I'm not talking about stopping it. We just need to change where we do it. A study done at UC Davis has discovered that, if we remove every tree from 45 degrees north and up, we'll cool the planet. If it seems like it's counter intuitive, that's because it is. Trees are carbon sinks. The absorb carbon, which in turn cools the planet. When tree's are removed, all that carbon is released. Well, trees also act like heat sinks. During the day, a forest will absorb a lot of heat. heat which they retain at night. If every tree north of 45 degrees, (Montana in the US, Bordeaux in France), were removed, the loss of the heat retention would more than off set the extra carbon in the atmosphere. Also, the open areas created would act like giant mirrors in the winter when they are covered in snow and reflect the heat back away from the Earth. I'm not saying we should do this. In fact, I think it would be terrible if the idea were even seriously discussed. But, the science is there. While it would do more harm in other areas of the Earths biosphere, it would take care of global warming.